We are happy to bring you Marian Small's WHEN JOHNNIE DOESN'T COME MARCHING HOME blog tour! Please leave a comment to let Marian know you stopped by! 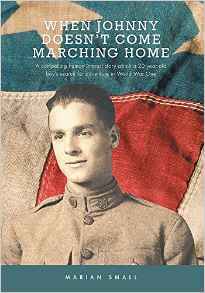 First-time author Marian Small’s WHEN JOHNNY DOESN’T COME MARCHING HOME does for World War I what Tom Brokaw’s THE GREATEST GENERATION did for World War II.